The shoemaker’s great-grandfather opened his shop at the end of the 19th century to make shoes by hand for Neapolitan aristocrats. After inventing the predecessor to the stiletto in the 1950s, the company spun off to exclusively produce their popular Capri-style sandals. Located in the bustling city of Naples, this factory is known for their use of top-quality materials and innovation in special ornamentation. After discovering them on our travels, we knew immediately that they were the right partner to help us bring our sandal vision to life. The Capriana runs small. We suggest that you size up from your US shoe size. The Capriana (“from Capri”) is an easy slip-on, slip-off style that evokes the simplicity and sophistication of summer in the Mediterranean. 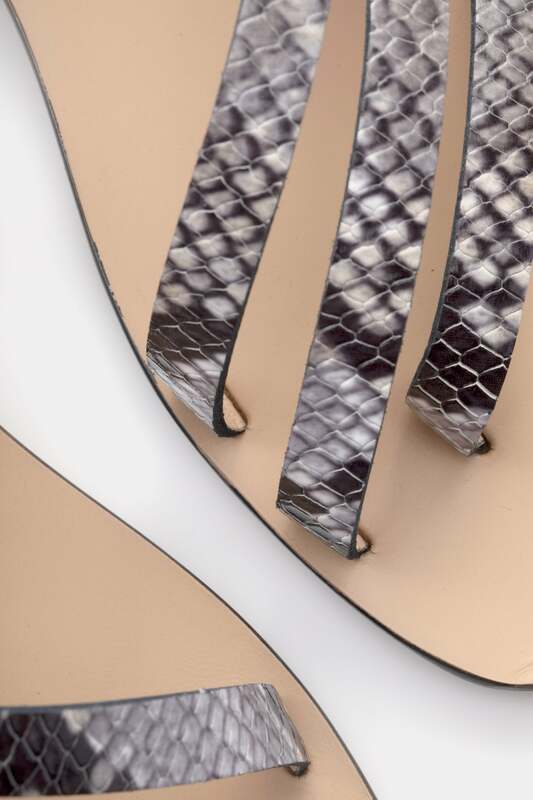 The distinctive details—the diagonal straps in the season’s must-have python print—make this shoe a glamorous and versatile choice for day or night.